The Oldest Diva is really into graphic novels but this was a genre I was not too familiar with. In my quest to keep her engaged with reading, I decided to delve in and see what had captivated her attention. In the process I found some highly engaging novels with captivating characters, amazing artwork and relatable plots. Smile (& Sisters too!) 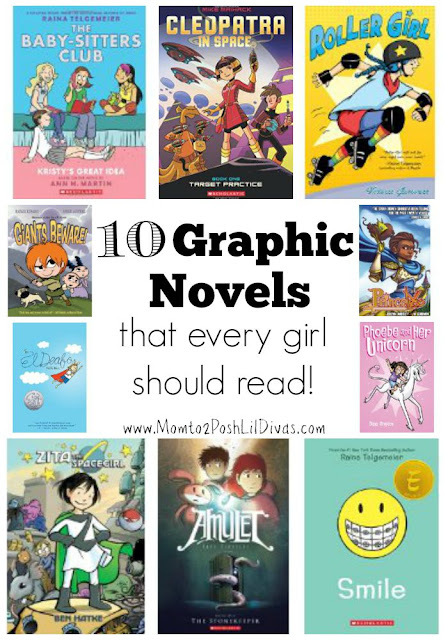 by Raina Telgemeier - We adore Raina's graphic novels. My 9 year old stumbled upon Sisters at a school book fair and was instantly drawn to it because 1.) It was about two sisters (definitely relatable!) and 2.) It was a graphic novel which is currently her favorite genre. She has read both Smile and Sisters numerous times. Raina writes in a relatable and laugh out loud humorous manner. I love that the sisters learn how important that they are to each other in Sisters and that Raina learns to embrace who she is, how she looks and what being a true friend means in Smile. We hope there is more to come! The Baby-Sitters Club Graphix by Raina Telgemeier - I loved the Babysitters Club books when I was in elementary school. I was so excited to find them in graphic novel form by our fave author because I knew my daughter would be drawn in. I was 100% correct! She can't wait for more of these to be released and reads them as soon as they arrive in the mail. Zita the Spacegirl Series by Ben Hatke - Zita's best friend is abducted by aliens and she must save him. These books are fun and captivating as we join Zita on her intergalactic adventures. Her adventures are filled with fantastical creatures, unique friends and lots of bravery. Roller Girl by Victoria Jamieson - Being 12 isn't easy, especially when your faced with best friend troubles, impending junior high and joining a junior roller derby league when you can barely skate. Astrid has heart, spirit and determination. The book has lessons on friendship, being honest, working hard, perseverance and even the parent-child relationship. The story was realistic, humorous and heartfelt. This is Victoria Jamieson's debut novel and we look forward to seeing more from her in the near future. El Deafo by Cece Bell - Cece suffers from hearing loss and must wear a hearing aid. She feels different, isolated and longs to simply fit in. The story chronicles her journey in an honest and relatable way. As a mom, I really liked that Cece was a strong character who ultimately learns that her disability was not a weakness. Amulet Series by Kazu Kibuishi - Emily & Navin lose their father in a tragic accident and are forced to move into their deceased great-grandfather's house where they find a mysterious amulet and are thrust into a dangerous adventure to save their mother. These novels are a little dark and deal with some sensitive subject matter (parental death) but the art work is amazing and each novel delves a bit deeper into the characters and leaves you wanting you more. Giants Beware! (The Chronicles of Claudette Series) by Jorge Aguirre - More than anything Claudette wants to be a giant slayer so she embarks on a quest to find a giant. Claudette is feisty, brave and not your "typical" girl which my daughter loved. The characters are relatable, the plot is engaging and the artwork enthralling. This is one that will be read again and again. Phoebe and Her Unicorn by Dana Simpson - This one was handpicked by the Littlest Diva and initially met with resistance by the Old Diva because it was pink and featured unicorns. Well, Phoebe ultimately managed to worm her way into the hearts of both girls with her sarcasm, humor and quirkiness. In short, don't let all the pink fool you - this is more than just a cutesy book. The Princeless Series by Jeremy Whitley - These are not your typical helpless princesses. They are brave, daring and adventurous. You'll get hooked and want to read more - we did! Cleopatra in Space Series by Mike Maihack - It's Cleopatra of Ancient Egypt BUT with a sci-fi twist. This Cleopatra gets zapped forward in time and onto a distant planet where she finds herself having to save the universe. Fun story, engaging characters (there are talking cats!) and awesome artwork. So far there are 2 novels in this series but we'll definitely be seeing more and we're looking forward to them. Do you have other graphic novels to recommend to us that we should add to our "must read" list?